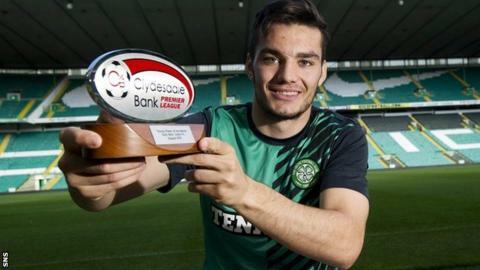 Celtic forward Tony Watt has been voted Clydesdale Bank Premier League young player of the month for August. The 18-year-old featured in two league matches last month, scoring twice in . Watt also helped Celtic qualify for the group stages of the Champions League, appearing as a substitute in both legs of their play-off with Helsingborgs. "You want to play at the highest level you can and I'm doing that as much as possible just now," he said. "Obviously I've been handed a few chances by the manager. It's been good to get minutes on the park, especially at first team level and getting the opportunity to play for the [Scotland] Under-21s. It's good to be involved. "At 18 and playing for the Under-21 team, I couldn't ask for a better start to the season." Watt netted his first Under-21 international with a penalty against Luxembourg and he followed that up by scoring in Austria. However, the young Scots missed out on a play-off place for the European Championships. "I felt heartbroken about that," said Watt. "It would have been a good opportunity to play in the play-offs." Celtic signed Miku on transfer deadline day and another forward, free agent Lassad Nouioui, joined earlier this month. "You've obviously got another two strikers in contention," added Watt. "So we'll just need to wait and see how it goes and hopefully be involved at the weekend. "If I'm on the bench that's good, if I start even better."